YouTube has been one important access to enjoy 3D movies for people, since it added a 3D viewing channel on YouTube player. This 3D source make people enjoy 3D movies no matter at home or at hotel during the trip only you have a pair of 3D glasses, 3D displays and internet. But sometimes, the movie you want to enjoy is on Blu-ray disc rather than YouTube and it is 2D mode and is not convenient to carry. In this case, how can we watch this 2D Blu-ray with 3D effect? Or we can say how can we upload this 2D Blu-ray to YouTube with 3D effect so that you and the person who has the same favor with you can enjoy it? Learn More: How to Convert YouTube 3D video to 3D SBS MP4 with 1080p for Sony 3D TV? To fulfill this task, you have to need the help of professional Blu-ray ripper. In my Blu-ray ripping experience, Pavtube BDMagic deserves to be recommended for its intuitive interface and powerful function. It can rip and backup the newest and region-locked 2D Blu-ray to YouTube playable MP4/AVI/MKV/MOV in 3D mode with fast speed and original video quality. From its review, we can know that it allows you to reset video/audio size, codec, bitrate to get the most suitable video for YouTube. 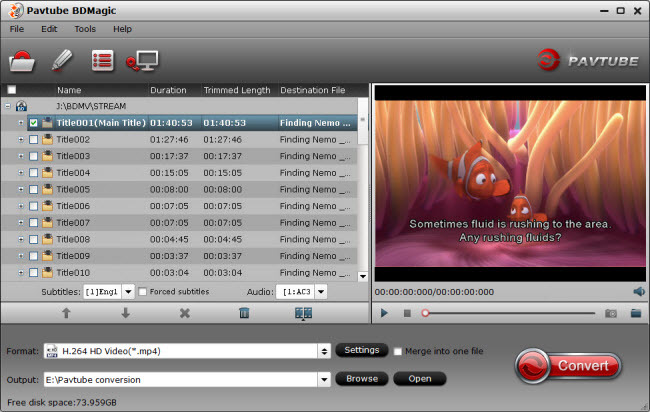 Click “File” to load your 2D Blu-ray movie to this programme. It will automatically choose the main content to convert. If there are several language subtitles in your Blu-ray movies, you can select the language subtitle you want to show in your movie by “Subtitle”. 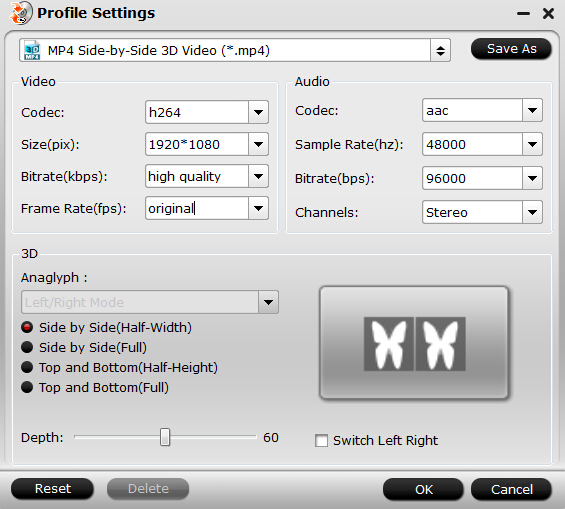 For outputting 3D movie for YouTube, you can choose “MP4 Side-by-Side 3D Video(*.mp4) ” under “3D Video” category. In this category, it has other 3D format, like 3D MKV, MOV, etc. 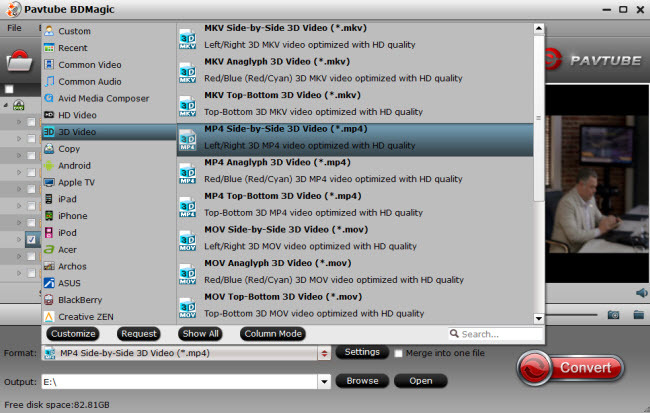 So you also can choose output 3D MKV for YouTube. Tip: Open profile settings window by clicking “Settings”. Here you can adjust video parameters. YouTube should supports a final resolution up to 3840×1080. If your Blu-ray movie is not up to this resolution, you just can simply set it to 1920*1080. And if it is possible, you’d better keep an original frame rate. After finish the above clicks, now you can hit the “Convert” button on the main UI to transfer your 2D Blu-ray to MP4 Side-by-Side 3D video for YouTube 3D channel. How to upload 3D video to YouTube? Log in to your account on YouTube and upload video in the normal way. 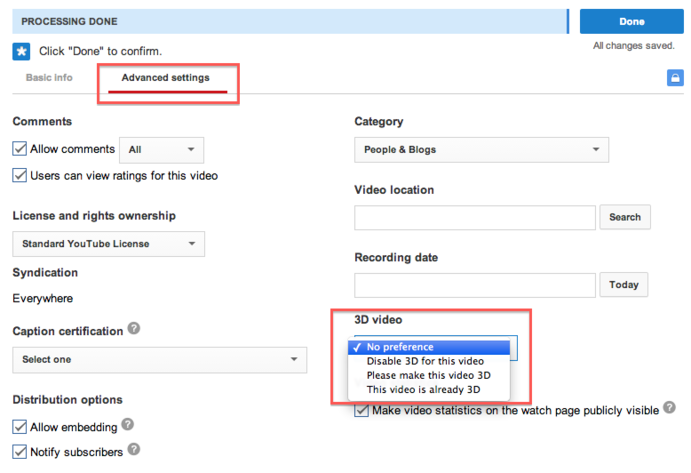 And click “Advance Settings” bar to choose “This video is already 3D” from “3D Video”. After chose “This video is already 3D”, now you should select 3D arrangement mode to “Side by side: Left video on the left side”. Now, your ripped Blu-ray movie should be uploaded to YouTube successfully and be watched in 3D effect. If the displaying is not 3D mode, just open “Settings” and choose “3D ON” icon. Don’t forget to share this video to your Facebook friends and invite them to watch your 2D Blu-ray o YouTube with 3D effect. Watch 3D Blu-ray on Oculus Rift CV1?